The Boyd (aka SamEric) Theater. Illustration by Davis Cone. The (majority of the) titles cited in this section were presented in 70-millimeter and with some flavor of stereophonic sound (typically six-track). Other large format processes (i.e. Cinerama, VistaVision, etc.) are noted in brackets where applicable. The Cinerama-branded 70mm presentations during the 1963-69 period are noted as “Cinerama” (with an emphasis on the quotation marks to signify that it wasn’t the original, genuine 3-panel Cinerama process). Details pertaining to origination format (i.e. 65mm or 35mm blow-up) have not been addressed since the listing is meant to be an exhibition-based chronology. The “roadshows” have been listed with an asterisk following the applicable titles. These were reserved-seat engagements with advanced pricing and limited, scheduled showtimes (typically ten-per-week or two-a-day). Souvenir programs were usually sold and often the presentations included an overture, intermission, entr’acte, and exit music. Despite a popular misconception, many of the roadshows were screened in a 35mm presentation (rather than in 70mm) and effort has been made to identify these with a “35mm” notation or “format undetermined” whenever the projection process could not be determined or was vaguely or ambiguously addressed in promotional material. Pre-1953 roadshows have not been addressed in this work. The duration of the engagements, measured in weeks, is included in parenthesis after each entry. IMAX and other special venue presentations have not been included (though they might be added in a future revision). Note that some of the movies included in this listing were presented in 35mm during the latter week(s) of engagement due to print damage or, in the case of a multiplex booking, movement to a smaller, 35mm-only auditorium within a cinema complex. And in a few cases the reverse was true whereas a booking began with a 35mm print and switched mid-run to 70mm. In these cases, the 35mm portion of the engagement has been included in the duration figure. 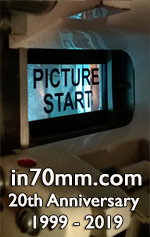 Part 3: Which 70mm releases were not presented in 70mm in Philadelphia? Here is a listing of movies with a confirmed 70mm release in North America that played the Philadelphia market only in 35mm (or not at all). Titles marked with a triple asterisk played the Philly area in 70mm only during a second run or subsequent booking, and titles marked # played in 70mm only during advance pre-release screening(s). Titles marked ## were photographed in 70mm (65mm) but which there is no record of any 70mm prints being struck for release. Various issues of Boxoffice, Philadelphia Daily News, The Philadelphia Inquirer and Variety, plus Dolby sound system installation records, projector and sound system trade advertisements, and the book “Popcorn Palaces: The Art Deco Movie Theatre Paintings of Davis Cone” (Michael D. Kinerk and Dennis W. Wilhelm; Harry N. Abrams, Inc.; 2001). Special Thanks: Neil S. Bulk, Allen Hause, Mark Marshall, Jim Perry, Joe Tommassello.